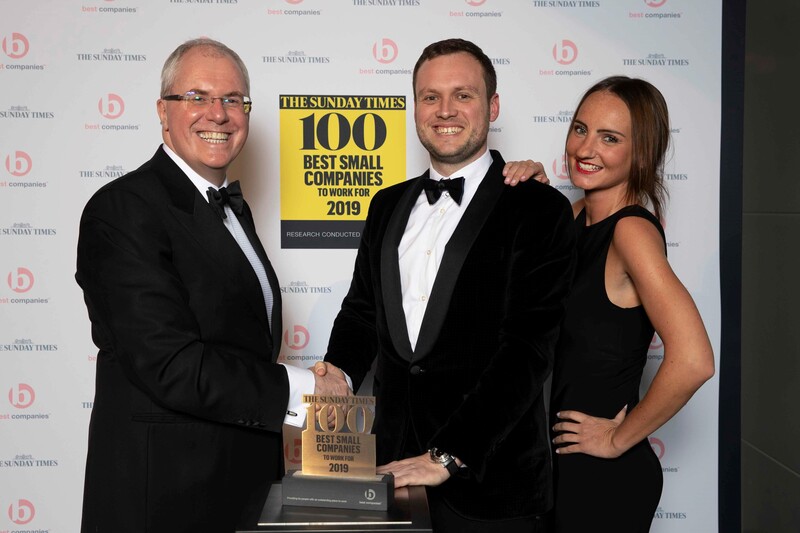 ThirdWay has been ranked 10th place at The Sunday Times Top 100 Best Small Companies to Work For Awards 2019 and was also awarded the coveted ‘Special Award for Wellbeing’, in addition to a 3-star accreditation which reflects the group’s extraordinary levels of workplace engagement. The award ceremony, which took place at Battersea Evolution on Wednesday evening, was hosted by TV personality Mark Durden-Smith and included entertainment from three mind-blowing performance gymnasts. A 20-strong team of ThirdWay staff attended the event to celebrate their position within the Top 10 as well as the recognition of the company’s commitment to its employees and enviably enjoyable work culture. The ‘Special Award for Wellbeing’ was awarded due to ThirdWay’s commitment to encouraging health and wellbeing in the workplace by providing fruit, healthy meals, team-led sporting activities, monthly massages, weekly meditation sessions and access to mental health support should it be needed. The company was also recognized with star ratings for 6 further categories including Leadership, Personal growth, and Giving Something Back. The ThirdWay Group founder Ben Gillam, comments: “Our business is all about people – mobilizing and inspiring people within our business and our clients’ businesses. It’s great to see some of our own clients amongst the Top 100. These accolades are a result of those people committing their time, energy and creativity to establishing the best workplaces in the UK."